In line with current requirements in this age of digital manufacturing, the scientists from Stuttgart are presenting an intelligent interplay of different exhibits at the AUTOMATICA in Munich from 21st till 24th June 2016. 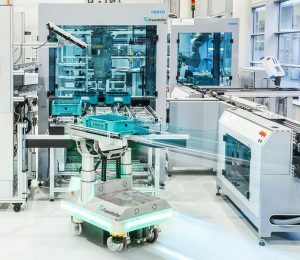 Covering the fields of man at the workplace, products and automation, as well as IT infrastructure and networking, the exhibits demonstrate the added value offered by a production plant geared towards Industrie 4.0. At the Fraunhofer IPA booth, the four cornerstones of Industrie 4.0 can be experienced in various ways within the overall context of a digital production: a wide range of cyberphysical systems, a participatory platform, the Internet of things and services, and also a portal with intuitive man-machine interfaces for interacting with the manufacturing system. With the aid of exhibits interacting intelligently with the cloud, visitors can comprehend the solutions offered by the research institute for various segments of the value chain. These range from singularization, though (partially-)automated assembly processes and workpiece transportation, right up to networking components with the IT infrastructure. The services are not only relevant to users and decision-makers in manufacturing enterprises but also to their suppliers: for planning, operating and optimizing production plants, as well as developing innovative industrial components, machines and systems. At the AUTOMATICA, »Virtual Fort Knox« plays a key role: various demonstrators are linked via the platform. As with a real production plant, a wide range of near real-time status and process data is collected in the system for direct processing. The huge advantage, in particular for small and medium-sized enterprises, is that users can access the information from applications via an output medium of their choice. This does away with the need to procure and maintain a suitable IT environment. Furthermore, the user is billed for the use of the software and hardware on a »pay-as-you-go« basis, thus avoiding fixed costs. 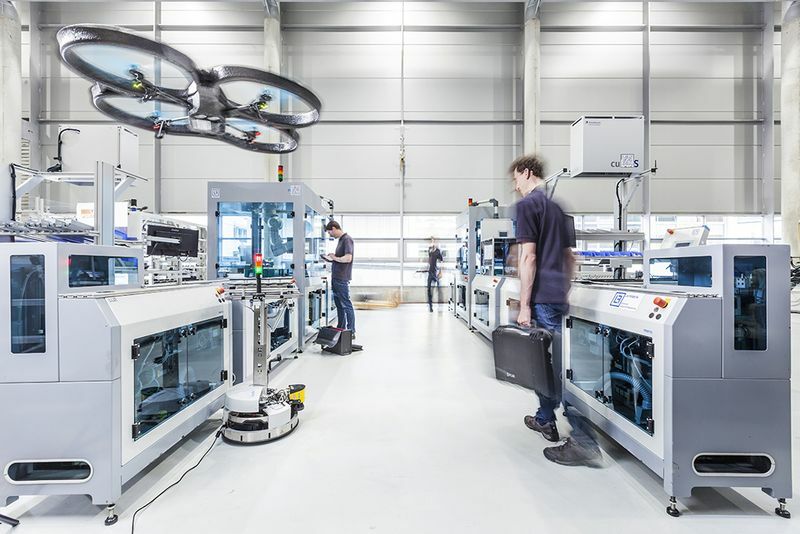 The basic technical requirement for an Industrie 4.0 environment is that all equipment with integrated sensors and controllers has to be networked as a cyber-physical system (CPS). A typical example of a CPS is robot systems, such as the bin-picking IPA demonstrator on show at the booth. The manufacturer-independent software bp3™ enables the robot to locate objects rapidly and reliably and plan trajectories for numerous workpieces. A further exhibit presents the advantages of a software package that can be used in conjunction with nearly all types and makes of robot to perform numerous assembly tasks. For the first time, complex tasks that were previously carried out manually, such as assembling switching cabinets, can now be taught intuitively by non-experts and thus be automated cost-effectively. Through their connection to the cloud architecture, the potential of both software solutions is extended: thanks to the central data pool containing information on workpieces or program modules for direct implementation – so-called skills – robot systems can be put into operation and maintained more efficiently than in the past, components replaced easier and all processes traced and controlled centrally. This not only makes robot systems more adaptable but also significantly speeds up retrofitting to accommodate new product variants. Via a range of services, the cloud also offers new software functions. Similarly, locally-optimized processes can be played back to the cloud, thus enabling all networked robot systems to benefit from once-only program changes. For flexible transport solutions, the IPA experts have developed »Cloud Navigation«. The advantage of this information is demonstrated by example at the booth with the aid of two mobile, self-navigating systems. Since both automated guided vehicles (AGVs), or multiple AGVs in an industrial context, supply their locally-acquired data to a central point, the entire fleet benefits from more accurate localization and more efficient pathplanning. The AGVs could then act as »lean clients«, i.e. because computer-intensive navigation algorithms could be outsourced to the cloud server, they would require less hardware but would still retain a high degree of navigation intelligence. External sensors, e.g. from the manufacturing environment, could be integrated, as well as navigation functions provided in the form of services. A further key element of Industrie 4.0 is the continuous monitoring of all process steps. This is achieved with »Smart System Optimization« developed at Fraunhofer IPA, which can be implemented without the need for expert IT knowledge. The mobile system collects and automatically analyzes near real-time component and process data using intelligent cameras, generally installed singly at each production station. The system not only detects process aberrations and their cause but also identifies possible losses or bottlenecks. In areas where »Smart System Optimization« is utilized, companies can increase their efficiency by more than ten percent. Moreover, with the intelligent workpiece carrier »smartWT«, single workpieces can also contribute towards process monitoring. Integrated sensors constantly gather logistics and process data relevant to quality and transmit the information wirelessly to the cloud. The user has access to current data at all times and can intervene as required, thus improving production quality and throughput. As far as the IT infrastructure is concerned, Fraunhofer IPA also has a solution tailored to the demands of an adaptable production plant: with the software »Sense&Act«, companies can devise individual rules to network production equipment. Modifications to the IT, as well as extensions and new interfaces, can be realized at little effort. The software uses sensor data to monitor production, for example to detect system errors. Under certain circumstances, it initiates specific action, such as notifying the user or implementing a measure on the robotic system. Sensors and actuators are swiftly regulated via an intuitive user interface, or shared throughout the company and evaluated. Even in Industrie 4.0 environments, the close involvement of man and his abilities in production brings significant advantages. How this can be achieved, even in the case of burdensome tasks and in view of the demographic change, is demonstrated by the first work exoskeleton that is capable of aiding the worker with overhead tasks. The assembly workplace is linked to the IT infrastructure and adapts automatically to the worker’s individual body measurements as well as the assembly process required. This reduces set-up times and relieves the strain off the worker. 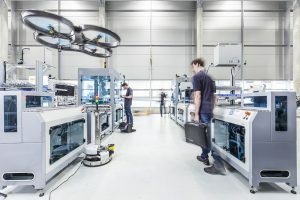 Additionally, a workplace analysis developed at Fraunhofer IPA quantifies how effectively the solution reduces the employee workload and optimizes production processes. 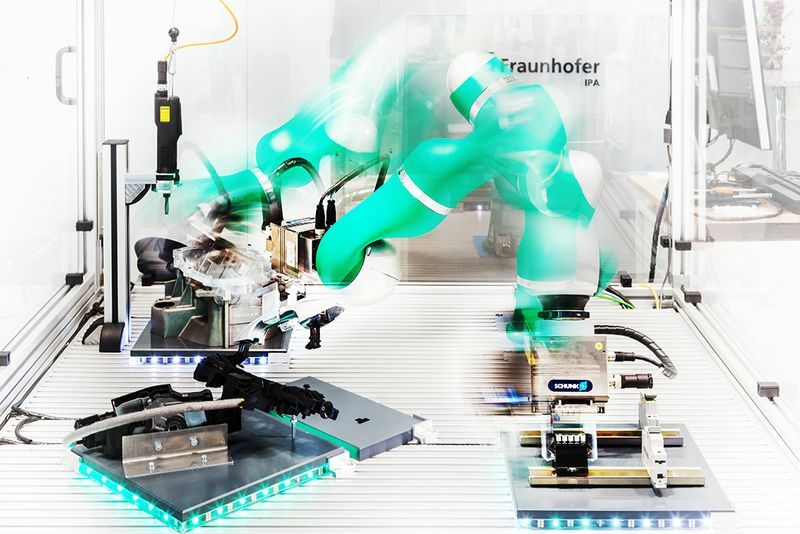 All the exhibits in the Industrie 4.0 environment have one thing in common in that they continuously collect information in the sense of »Smart Data«, which can then be used to optimize production. Visitors to the booth can see for themselves how the IPA experts visualize and analyze the sensor and status data acquired from an exhibit to advantage. The information gained from intelligent data analyses also represent approaches for new business models based on usage data, such as service intervals tailored to individual requirements or adaptions to product portfolios to suit customer needs. That theory alone is not enough is demonstrated by a cooperation initiative with TRUMPF: in the summer of 2015, the Ditzingen-based company – one of the world’s leading manufacturers of machine tools for flexible sheet metal processing and industrial lasers – entered into a five-year strategic cooperation with Fraunhofer IPA. The aim of the cooperation is to anchor knowledge from current research on Industrie 4.0 in sheet metal processing. 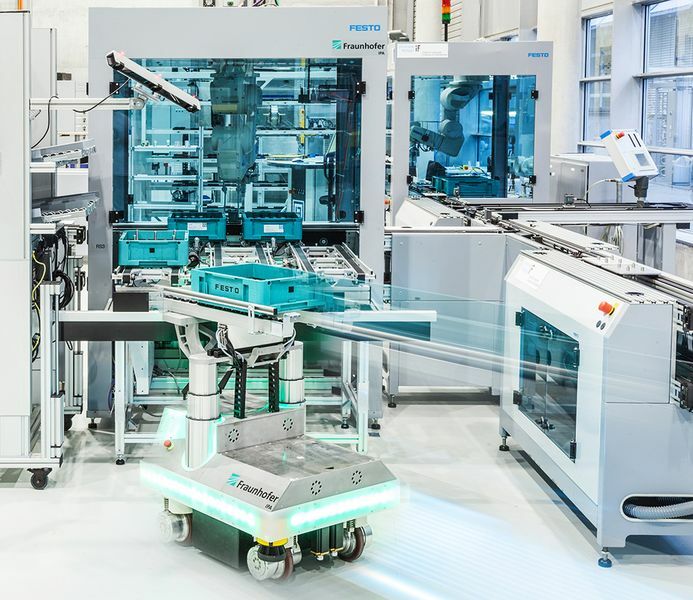 In the so-called »flexible sheet metal processing lab«, workers from TRUMPF and Fraunhofer IPA are working together on innovative solutions for production technologies of tomorrow. In initial starter projects, the areas of »intralogistics«, »service-oriented machines« and »autonomous production« are being handled. The aim is to further develop the contents of the cooperation as it progresses with new project topics being regularly added. Ulrich Schneider, project manager at Fraunhofer IPA, will be reporting on the joint cooperation scheme during AUTOMATICA on 24th June at 11 a.m. Together with Dr. Martin Landherr, he will be presenting the project under the title »Think in business models, work in cooperations – cooperation with TRUMPF as a practical example of the Application Center Industrie 4.0«. He will also talk about the Application Center Industrie 4.0, which is located at the Fraunhofer Institute Center. This is a test environment for industrial research that unites cyber-physical systems with a real manufacturing environment.